This entry was posted in Uncategorized by BrianBish. Bookmark the permalink. There has to be a medium ground on passwords. 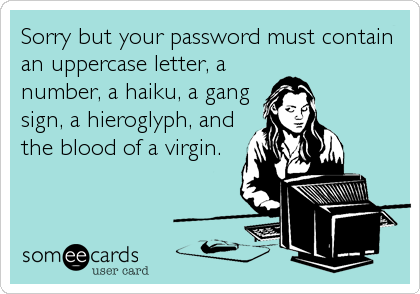 I especially hate those sights I use infrequently, that require that I change my password EVERY single time. I run out of clever things I can remember. Acronyms don’t help, because all it takes is to misremember that “and” starts with “&,” in this case, and the whole thing is off. I am forced to come up with new passwords so many times, that they do far more to keep ME out of my sites than they do to discourage the hackers. Holy cow! How about some memory tips? What if I forget the secure location of all my passwords? I think I will use passwords like, “f***yuhacker” so if I get hacked at least I will have the satisfaction of telling the hacker how I feel. Great post, Brian, very helpful. Thanks for the article. Do you know of any recommended password manager programs or apps? Don’t know if this link will work here but this recent PCMag article mentions a few. Looking for some real world users to weigh in.